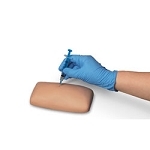 This revolutionary training arm provides complete venous access for IV therapy and phlebotomy, plus sites for intramuscular and intradermal injections. 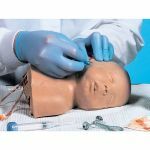 An extensive 8-line vascular system allows students to practice venipuncture at all primary and secondary locations, including starting IVs and introducing Over the Needle IV Catheters. 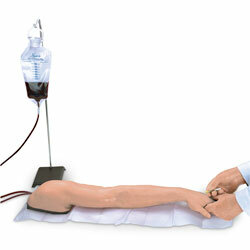 The venous system simplifies setup with only one external fluid bag supplying artificial blood to all veins simultaneously. The dorsal surface of the hand includes injectable metacarpal, digital, and thumb veins. The antecubital fossa includes the median cephalic, median basilic, and median cubital veins. Venipuncture can also be performed along the basilic, cephalic, accessory cephalic, and median antebrachial veins. Intramuscular injections may be performed in the deltoid muscle and intradermal injection sites are located in the upper arm. Intramuscular injections into the deltoid muscle are enhanced by the soft, lifelike skin and by the natural bony landmarks in the region. Intradermal injections using distilled water will create characteristic skin welts at designated sites on the upper arm. The realism of the Life/form Advanced Venipuncture and Injection Arm is truly amazing. The soft, flexible fingers are molded separately with extreme attention paid to every detail - right down to the fingerprints! Flexion of the wrist helps students develop manipulation skills. The replaceable skin rolls as the veins are palpated, and a discernable ôpopö is felt when entering the veins. 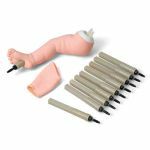 The Life/form molding process reproduces the fine details of the skin to make the arm look and feel alive. Valves in the veins can be seen and palpated on the skin surface. Simulated veins and skin are completely replaceable to keep this training arm looking and working like new. Under normal use, hundreds of injections may be performed before the veins or skin need to be replaced. 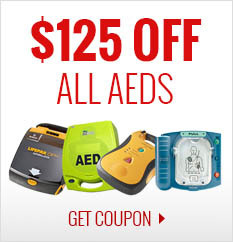 Complete replacement kits are available and easy to use. To extend the life of the veins, an aerosol sealant is available to seal punctures and prevent leakage.